Emily posing with her little hair piece in she received for Christmas. The last few weeks have brought a lot of worry about what is happening in Emily's body as we wait for the next step with scans to see what is happening and where we decide to go. Emily has not been in any pain, and she has had plenty of energy (energy that daddy and I love to see), she has been to school this week. 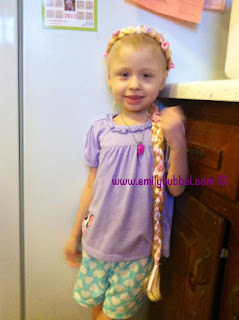 she has played with her sisters, she has enjoyed playing on the Wii Kinect, she has just been Emily. Now we would lie if we didn't tell you that each whimper of something hurts, and she touches somewhere, that we are not worried, because we are. Now with having to make a trip to Michigan tomorrow that we were not expecting just a few short weeks ago, is even more worries. There have been some amazing people and you know who you are out there, thank you so much for all you do and all that you continue to do, because it all helps. We did learn late yesterday that there is a wonderful volunteer from Wings of Mercy who can pick us up tomorrow and take us home Thursday. We are thankful for that, and thankful to have a rental car waiting for us when we arrive with the wonderful pilot getting a great rate for us. Thank you! I really haven't updated much more or less because our hearts are full of anxiety and worry and have been since we have been home. Since we have been home, there have been children who have passed from NB and other childhood cancers, and there have been relapses, so most of my update would be full of sadness and pain. So, I want to leave it at this...make sure you have your purple chalk (for neuroblastoma) (or the color chalk for childhood cancer) and yellow for childhood cancer awareness and make a ribbon and write under the ribbon, "Children get cancer too!" Tomorrow is a new week....it starts Emily's week of what is to come for her. Tomorrow is the worry as all the Hubbel's board a tiny plane (THANKS Wings of Mercy you are truly an amazing organization). Tuesday brings the worry of someone other then Elaine accessing Emily's port (love you Elaine and the comfort you bring to Emily). Wednesday brings the worry of yet another MIBG scan, although Emily handles them like a champ I still worry what all these injections are doing to her little body. Then come Thursday...23 days since we heard the word,"progression". Worry of what will Dr. Sholler have to say...Worry about what the cancer has been doing the last 23 days...Worry..., are the DFMO pills doing their job...Worry about what is the next step. I worry about Doug and Shannon and how they will find the strength to keep pushing forward...I worry about Emily and what she is thinking and feeling. The only thing I am not worrying about is keeping HOPE alive...we have to keep HOPE in our hearts, in our thoughts and in our minds. My HOPE for the next 4 days is in TEAM EMILY. We are ready to fight, ready to support, ready to pray, ready to keep the Hubbe'ls in our thoughts. My thoughts and prayer are with each of you, and my hope is still very much alive....I share my love, and my hope with each of you. God Bless each of you and may he watch over you, I pray the he will bless you all with comfort and love. Standing beside you praying and praying. While reading this post I couldn't help but see how worried you all are. I wanted to give you an acronym for WORRY so I prayed about it and here is what I got. God hears our prayers and worrying will only give you an ulcer. Trust in Him and pray like crazy. Lifting you all up and covering you in prayer. Have faith in God and believe in healing. 1 Peter 24 says we were healed and made whole. Confess and believe for God's word is true. You all may dislike me because of my strong faith and convictions, but when you trust God not man, you will walk in all His blessings and you will receive Emily's miracle. Stop giving cancer all the power and let God take over! Ther is also Danny Thomas's Children's Hospital - it is free. Go there if you do not have enough faith to believe that God can heal Emily. They do work miracles in the Danny Thomas Children's Hospital. Maybe you have looked for answers in all the wrong places. There is hope - there is always hope. God bless you all.